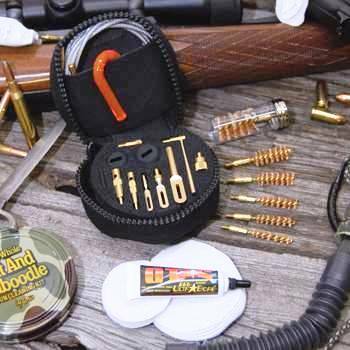 Otis makes a line of quality cleaning kits designed for the shooter to easily carry with them. The one pictured is their Tactical Cleaning System which is designed to clean a wide variety of calibers and shotgun gauges. They also make a large variety of kits for various weapons and purposes. The carrying cases are compact and fits well in a bug out bag. I have one in mine. The steel pull throughs are plastic coated to protect your bore, and it comes with a variety of slotted tips and bore brushes. There is room for cleaning patches and solvent. I carried this particular model while doing contract security in Afghanistan and it worked fine on Glock 19s, M-4s, AKs, Czech-58s and every other small arm I used it on. The Otis solvent that comes with it is good, but I supplemented it with a small bottle of Rem-Oil. The kit will also come with a small CD that gives a lot of really good information on proper firearms care. If you need a small portable cleaning kit, I can highly recommend this one. To check out the complete Otis line, visit their website at:http://www.otisgun.com or available here.